Gender equality, women’s rights and women’s empowerment are central to achieving the CFS vision of fostering the progressive realization of the right to adequate food, achieving food security for all, by raising levels of nutrition, improving agricultural productivity and natural resource management, and improving the lives of people in rural areas with full and equitable participation in decision-making. Without achieving gender equality, the full realisation of, women’s rights and women’s economic, social and political empowerment, especially for rural women, food security and nutrition will not be achieved. The focus on gender equality and women’s empowerment is explicit across all the UN Sustainable Development Goals (SDGs), both as a stand-alone goal – SDG 5 – and throughout the Agenda 2030. The objective of the CFS Forum on Women’s Empowerment in the Context of Food Security and Nutrition (the ‘Forum’) was to discuss the challenges that remain in realizing women’s empowerment, and to promote a shared understanding of how they are evolving in the context of food security and nutrition. The morning session focused on identifying emerging challenges and persisting barriers to women’s empowerment and on legal and policy instruments intended to overcome them. (j) The importance of gender equitable access to decent work and equal wages. (i) How are CFS policy outcomes promoting women’s empowerment, women’s rights and gender equality as a pre-requisite for food security and nutrition? (ii) Taking into account its mandate, what concrete steps can CFS take to further advance women’s empowerment, women’s rights and gender equality in its work to produce a tangible shift towards gender equality and enhance the implementation of the UN General Recommendation 34 of CEDAW (2016) on the rights of rural women? (iii) What actions are required and by whom in order to strengthen the content and implementation of national and international normative frameworks for women’s empowerment? – The importance of the role of women, especially those of rural women, as the subjects of rights was highlighted. – CFS should include the feminist perspective at an early stage when producing documents that will result in policy outcomes including gender disaggregated data and considering the root causes of women’s disempowerment and gender inequality. – Strong collaboration among the Rome Based Agencies was also mentioned. 5) Requests that measures to promote women’s empowerment, women’s and girls’ rights and gender equality be included in the CFS Plan of Action in response to the CFS independent evaluation. How are CFS policy outcomes promoting women’s empowerment, women’s rights and gender equality as a pre-requisite for food security and nutrition? 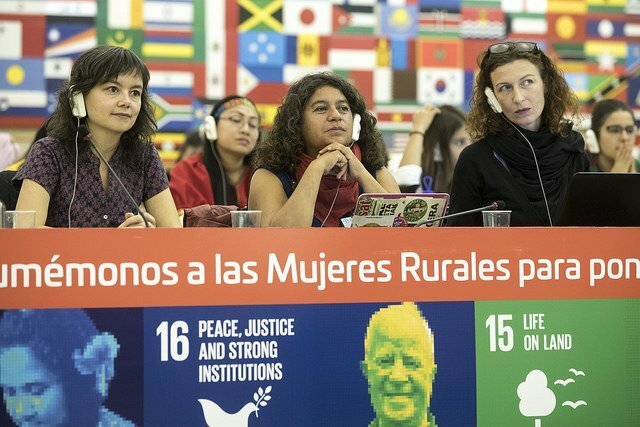 Taking into account its mandate, what concrete steps can CFS take to further advance women’s empowerment, women’s rights and gender equality in its work to produce a tangible shift towards gender equality and enhance the implementation of the UN General Recommendation 34 of CEDAW (2016) on the rights of rural women? What actions are required and by whom in order to strengthen the content and implementation of national and international normative frameworks for women’s empowerment?